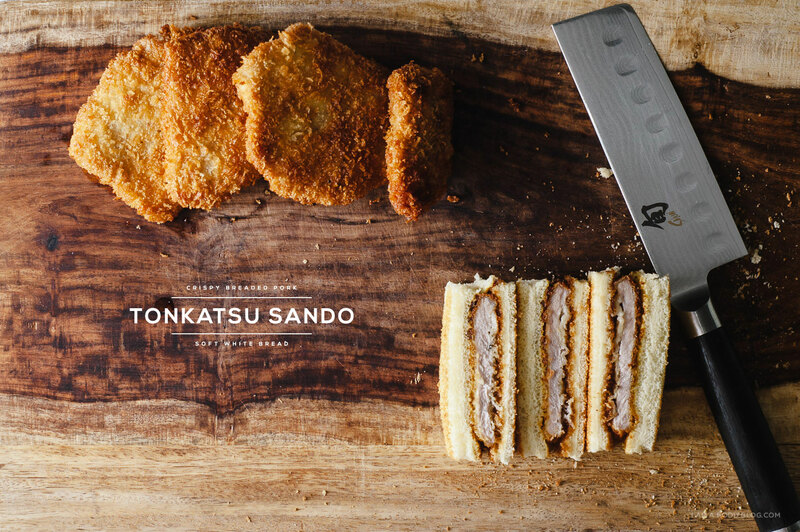 Katsu sandos are the sandwich of my dreams. It seems that most of the world has a version of schnitzel: cutlet-style meat, breaded and fried. I love meat, I love bread, and I love anything deep-fried, so it’s a no brainer that I love schnitzel-like foods. If we’re talking breaded meat, tonkatsu, hands down, is one of my favourites. Tonkatsu, like many things Japanese, runs from low-end comfort food to high-end perfection. You can make it at home, get it at a fast food joint, or have white gloved waiters bring it to you at a Michelin starred Tonkatsu-only restaurant. This tonkatsu is a down home kind of recipe, one that cooks up in a satisfying flash. You could have it with rice, drizzled with tonkatsu sauce, but I’ve opted for the sandwich form, which is faster than waiting for rice to cook. Using thin cut pork chops means that a katsu sando will take you under less than 10 minutes to make, from start to finish. It’s hard to beat crispy pork tucked into soft, fluffy, slightly toasted white bread. And yes, the bread should be white with the crusts cut off, please. Here in Tokyo it’s too easy to walk to the corner store, or visit one of the massive food halls where they have boxes and boxes of tonkatsu sandos just waiting for you to bite into. I know it’ll be one of the things that I miss most about this city so I’m happy to know that I can make a homemade version to satisfying my cravings. I’ve added a bit of mustard, which you don’t usually find in the store-bought sandwiches and I’ve left out shredded lettuce, which you sometimes do find. Use this recipe as a base – maybe you like tomatoes with your deep-fried pork cutlet, or maybe you love cheese. 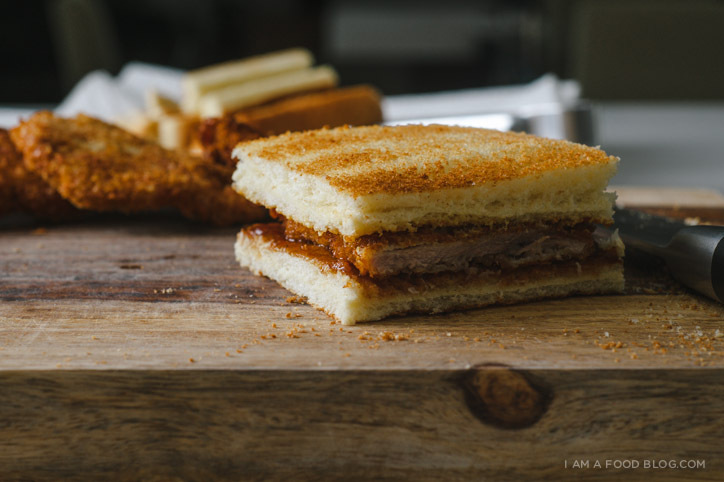 Spread the katsu sando love! Because friends, sandwiches are true love. 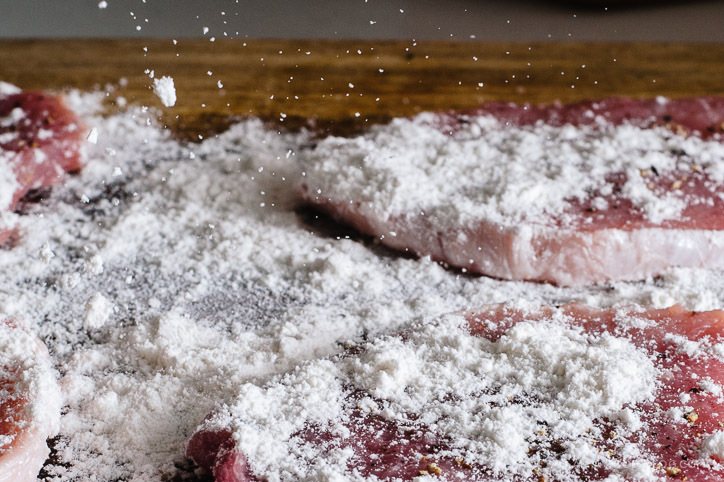 Lightly season both sides of the pork chops with salt and pepper and sprinkle with flour. Dip the chops into the lightly beaten egg and then into the panko, making sure that all sides are coated. Heat up half an inch of oil in a large frying pan over medium high heat. 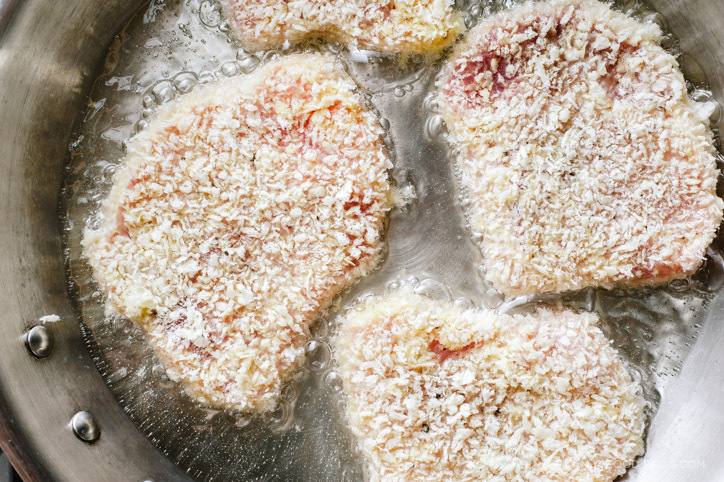 Fry the chops until golden brown and cooked through, flipping once, about 2 minutes per side. Drain on paper towels. Toast the bread and spread Kewpie mayo on one slice and Japanese mustard on the other. Drizzle the bread or chops with the tonkatsu sauce, place on a slice of bread and top with the other slice. Slice off the crusts, if desired and enjoy immediately. Thanks Tayler. I use a 50 mm 1.8. I use that one almost exclusively. Hope that helps! Yes to schnitzel and hot breaded meats of all kinds! This sandwich sounds excellent. I love how simple it is–although I also would be super tempted to punch it up with some harissa or something! Ooh, harissa would be wonderful! The pictures are amaaaaziiing….you are a true expert, I hope one day Ill be one too. I cannot deal with how good these look! 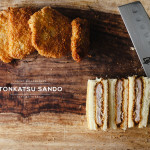 I love love love tonkatsu sandwiches from Maisen in Japan! The best! Yes! Maisen sandos are delicious! I recently made tonkatsu chicken and loved it. It’s so easy to make and so crispy! I double breadcrumbed it after finding a tip on the blog Rasa Malaysia which worked out really well. Great idea to put it in a sarnie! That looks delish!! Every time I make pork katsu I can’t help but make some japanese curry to slather over it! :) Love the knife by the way…I would not trade in my shun knives for anything! 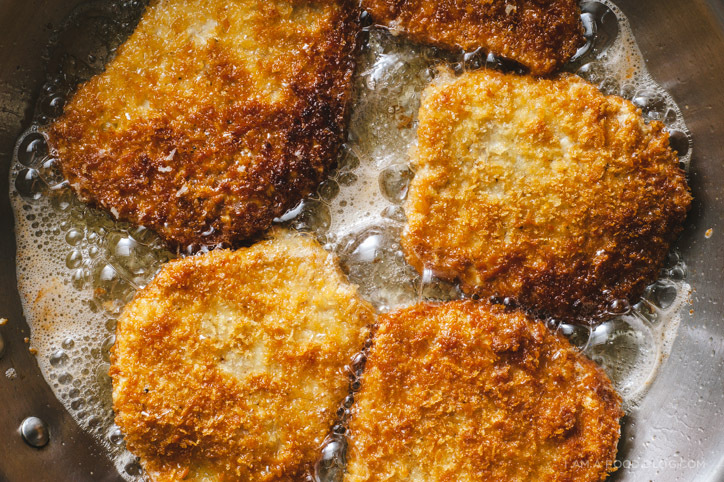 I am crazy for anything schnitzel-like…so good! I really want to put some sort of a pickle on that sandwich, even though it looks perfect as is. this is everything i want right now in this moment. crusts cut off and all. plz come cook for me?! Thanks for the recipe, I so loved eating these in Japan and now I can’t wait to make them on my own. This feels like a picnic. In all seriousness, which kind of Japanese Mustard are you using in this sandwich? I can’t seem to find the exact kind with a Google search.